Review Summary – Do We Recommend This Machine? If you’re thinking of buying this machine or a similar one, don’t let the numbers confuse you. There are different numbers for different models, but the only real differences between the models are the machines’ colors and whether they come with a milk container. In other words, there are many names for what is essentially the same machine. The information in this review is valid for all the model numbers – there is no real difference. Unfortunately the Melitta Caffeo CI is only available on Amazon.co.uk, and not available on Amazon.com. I’ve been using the Melitta Caffeo CI for several days now. It is very easy to use. We were also able to save personal settings immediately without any issues. 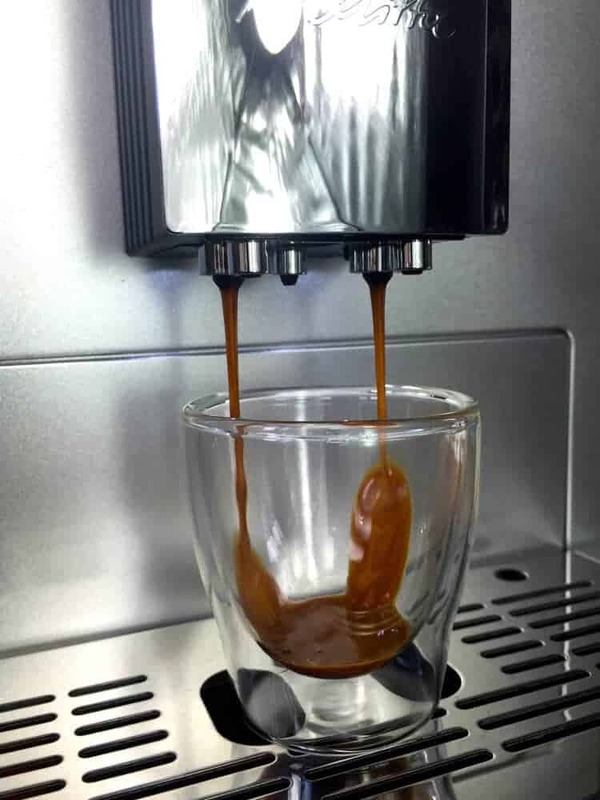 I also have been testing and reviewing super-automatic espresso machines for a while, and you can see an overview of the reviews and a comparison of super-automatic espresso machines here. Buy it now on Amazon.co.uk. 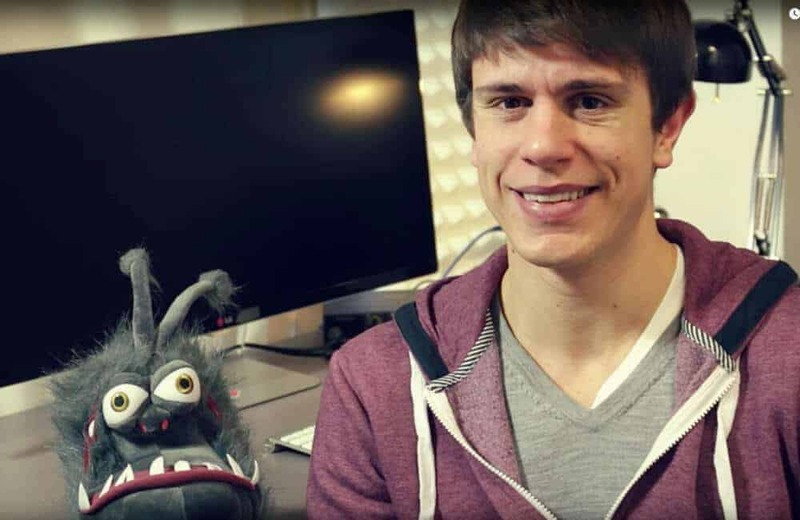 We’ve been using it for more than a year in our office and are very happy with it! The Melitta Caffeo CI has an exceptionally good balance between price and performance! The dual bean chambers are very handy. I can choose which of the two kinds of espresso I want to use. Until now, I hadn’t found that feature on any machine in this price class. The way Melitta gives you two chambers is simple: They just put in a dividing wall. I think that is a great solution. The Melitta Caffeo CI isn’t especially loud, but it is also not very quiet. It’s just average. The plastic milk container is quite large. Whether you like the size or not definitely comes down to personal preferences, though. This container has an advantage over insulated stainless-steel containers because you can easily see how much milk is left over through its plastic sides. Additionally, the milk foam system works excellently, quickly giving the foam a fine texture. It’s great how you can customize settings on the machine – the Caffeo CI is very user friendly. I’ve had experiences with machines that were significantly more expensive, but more difficult to use. Plus, at 5.5 inches (14 centimeters), the spout is nice and high. You will have to adjust some settings before making espresso because the factory presets are not that great (see below for more info). Once you’ve done that, you will get some really good results. Based on my experience, I can recommend the Melitta Caffeo CI. You can check the current price here on Amazon.co.uk. Update, July 13, 2016: We have put the Melitta Caffeo CI through a six-month, long-term test. That means that three to five people in our office have been using it every day. You can find the results of our long-term test later in this review. Water Filter and DecalcifyingThe Hose and Steam JetWater TankCleaning ProgramsRemovable Brewing UnitWhich Kinds of Milk Make Foam? You can download a PDF of the user’s manual here (the English section begins on page 21). Let’s talk about setting up the machine. When I took it out of the box, I noticed that many parts had a strong plastic smell. That is why I took all the parts that come into contact with water and gave them a good rinse with warm water. That made the smell go away. I put the included water filter into its place in the water tank. You will need to choose a language for the display when you set up the machine. For me, that was German. It’s no problem to set up. Using the machine is intuitive, although it doesn’t have a touchscreen display. Instead, it has buttons and knobs. Later on, I will explain which presets I changed, and how. 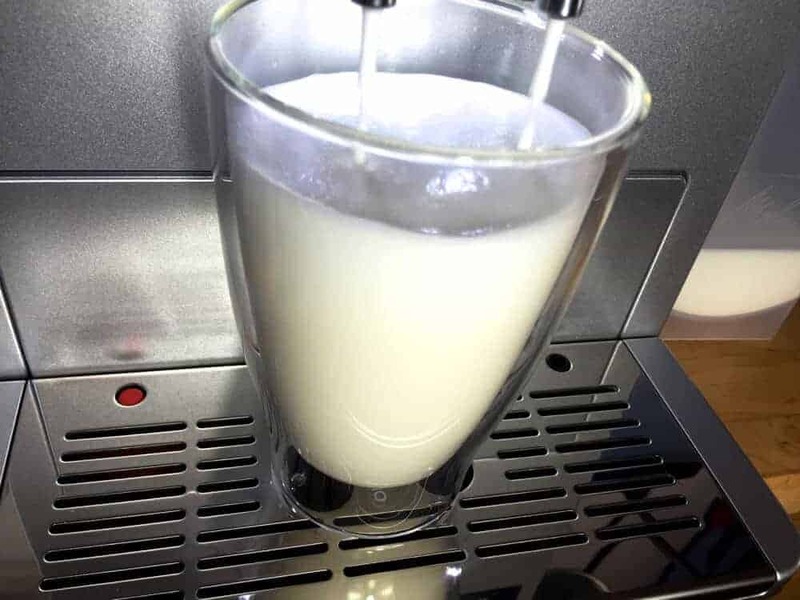 The machine has an automatic milk foam system. This means that hot, foamed milk is just the push of a button away. This kind of system is called a “cappuccinatore.” The Melitta Caffeo CI can also make two drinks simultaneously. That’s cool because then both drinks are ready at the same time. 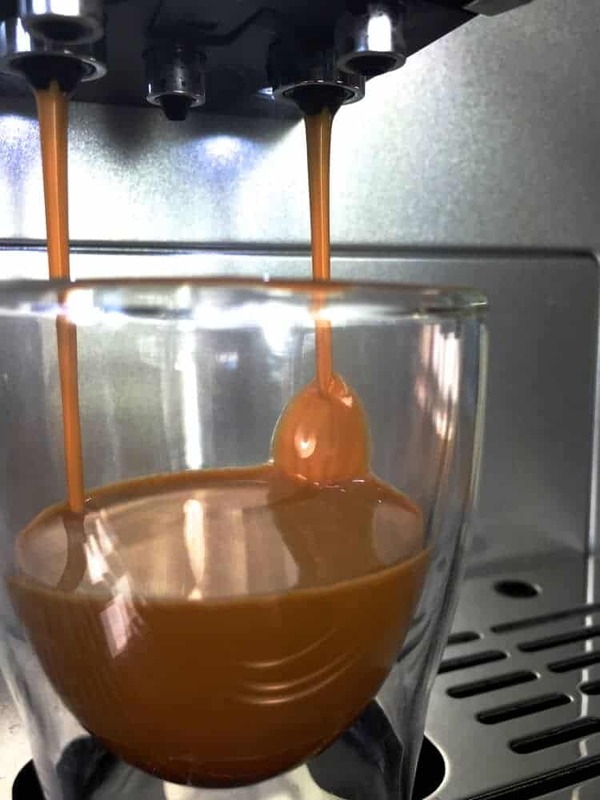 Until recently, this feature was pretty rare on automatic espresso machines, but these days, nearly all machines with an automatic milk foam system can make two drinks at once. A point in favor of the Melitta Caffeo CI is that it makes the milk foam quickly. This means you don’t need to wait a long time for your drink. It also makes high-quality milk foam that is homogenous, fine and creamy. The quality of the milk foam was a positive surprise for me. 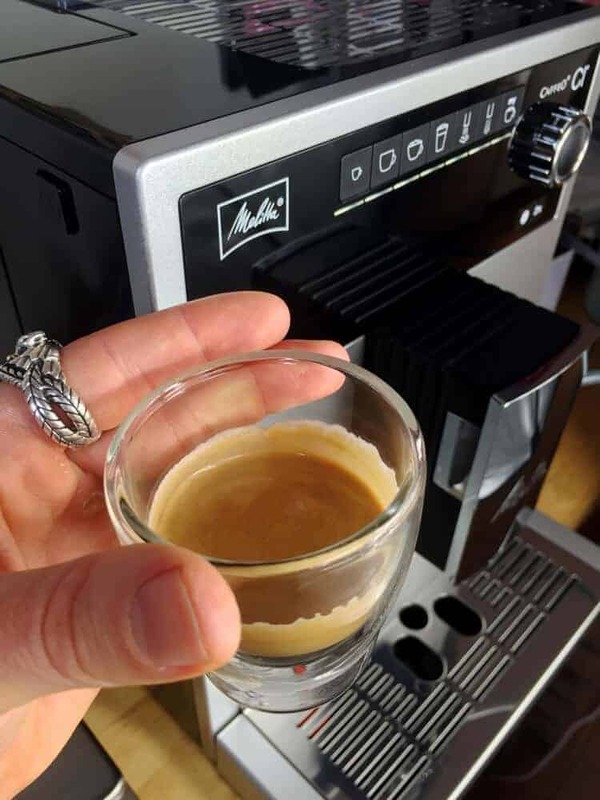 If you make an espresso with the Melitta Caffeo CI using the machine’s factory presets, you will get about 1.7 ounces (50 milliliters) of espresso – that’s too much. An espresso shot should be about 0.7 ounces (20 to 25 milliliters). However, the good news is that you can customize the machine’s settings. 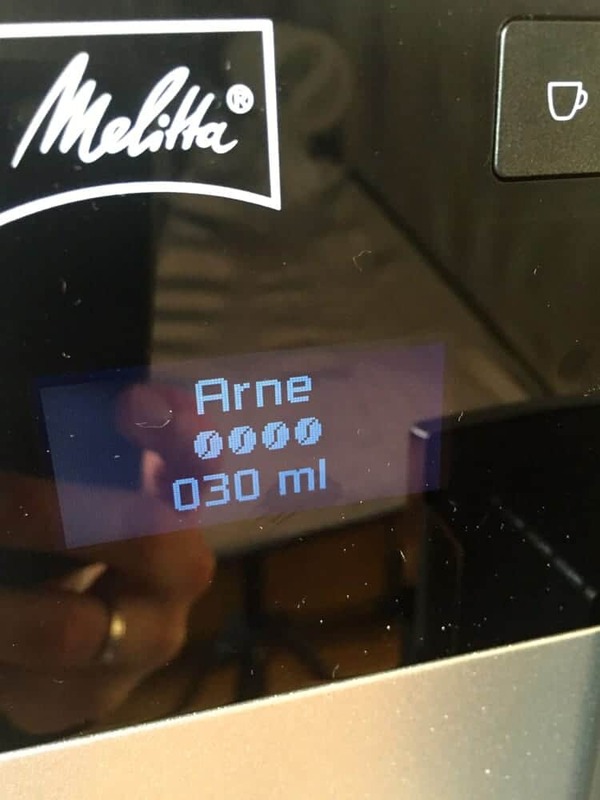 I set up an “Arne” profile and set it to the amount of espresso that I wanted. The lowest amount you can choose is 1 ounce (30 milliliters). I would have liked to set it even lower, but that’s how it goes sometimes. Still, 1 ounce was good enough. From my experience with many machines, I have noticed that, if you use the finest grinder setting and the highest level of coffee strength (i.e., the greatest amount of ground coffee), you get a bit less finished espresso as a result. That was also true for the Melitta Caffeo CI. 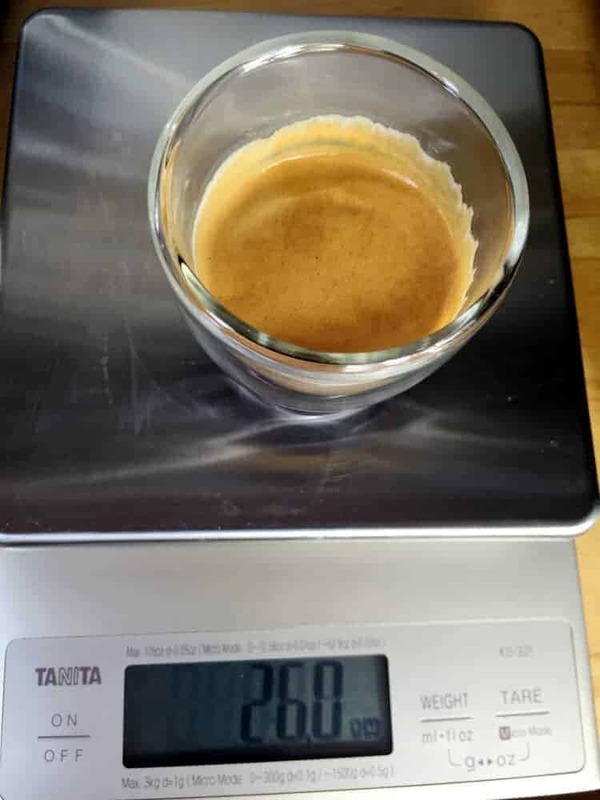 When I put the grinder on the finest setting and the ground coffee amount to the highest setting – and combined that with the 1-ounce amount in my settings – I consistently got 26 milliliters (about 0.8 ounces) of espresso. That’s a tad over the ideal amount, but I can live with it. The espresso flows out of the spout evenly, taking around 25 seconds. In this picture, I was testing an espresso with 50-percent Robusta beans. That’s why the espresso has so much crema. The espresso was about 0.8 ounces (26 milliliters) and had a nice, filled-out, speckled crema. It was really easy to find the right settings for me. I was surprised how easy it was to use the machine. It was also exciting to see that this automatic espresso machine had two separate chambers for espresso beans. That meant I could easily test different beans while keeping the same settings. It was also a cinch to set up my “Arne” profile. Which Coffee or Espresso Should I Use with the Melitta Caffeo CI? I tried out a few kinds of espresso with this machine, and all of them gave me good results. However, you should always use fresh espresso beans –they should have been roasted within the last three months. In general, I’d be cautious with fruity espressos. As is the case with all automatic espresso machines, the Melitta Caffeo CI tends to under-extract the espresso a little bit. This under-extraction happens because an automatic espresso machine grinds the beans more coarsely than a professional barista would. Because of this, fruity beans can easily lead to sour or bitter results. If a roaster describes an espresso bean as “chocolatey” or something like “classic southern Italian taste,” then you will probably get good results. If you enjoy drinking a strong espresso, have no fear using a blend that includes Robusta beans. There are some excellent blends that include Robusta. The dual bean chambers also let you do a direct taste test between two kinds of beans. If you compare fresh espresso beans with the stuff you can get at a supermarket, you will definitely want to stick with the fresh beans – and well you should. After you start up the Caffeo CI, you will have the option to make drinks using the factory presets. In my opinion, though, those settings aren’t great. Fortunately, it’s really easy to customize the settings to make exactly the drink you want. To do so, you will need to use the menu to set up a personal profile (you can have a total of four profiles). Then, for each different profile, you can adjust the settings for each different drink. I turned the temperature down by one notch, for example, as I like my lattes a bit cooler than most other people – but, hey, that’s why it lets you set up different profiles. 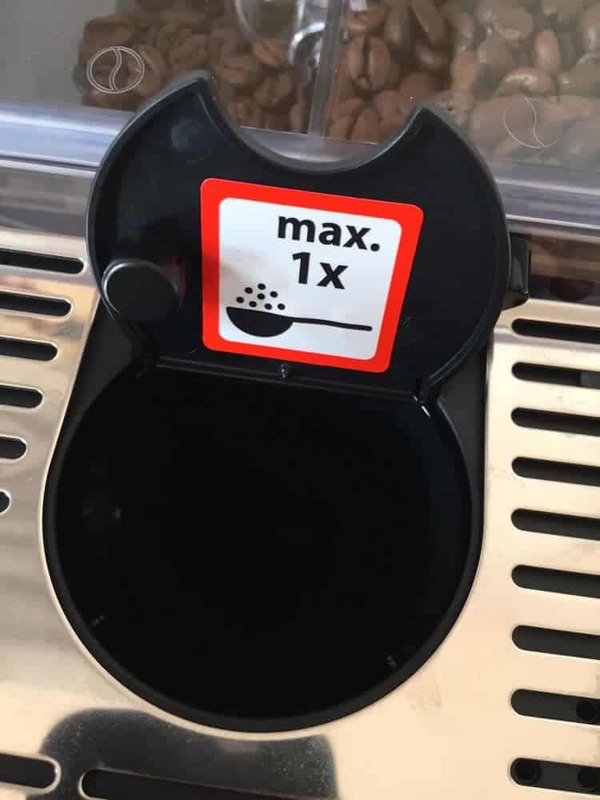 You can precisely set the amounts so that you get a nice, full cup of your favorite drink. It is all super easy to do, too. Once the settings were saved, I just needed to push the “My” button and then choose “Arne,” and then select the drink I wanted. Then it started to make my drink to my exact specifications. 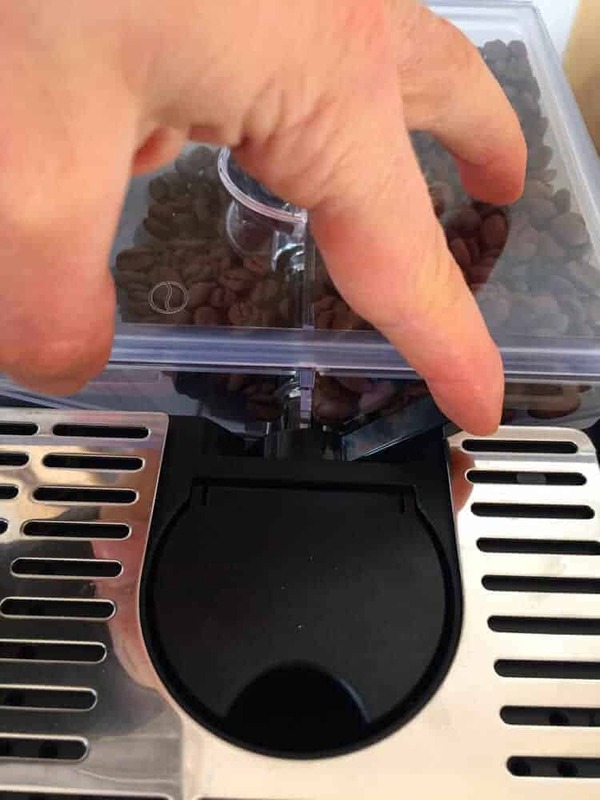 You can adjust the grinder by using a dial on the back of the Melitta Caffeo CI. There are four settings. If you go from a coarser setting to a finer one, you should adjust it one step at a time. Otherwise, the grinder might get jammed. First dial it down by one step, then make an espresso. Then move on the next step. I used the finest setting on the grinder. This machine has a stainless-steel conical grinder. That’s the most common kind of grinder found in automatic espresso machines. It’s relatively quiet compared to other grinders, especially DeLonghi machines. Automatic espresso machines have a lot of parts, some more useful than others. Let’s take a look at them. This is a feature that most automatic espresso machines come with these days, and the Melitta Caffeo CI is no exception. 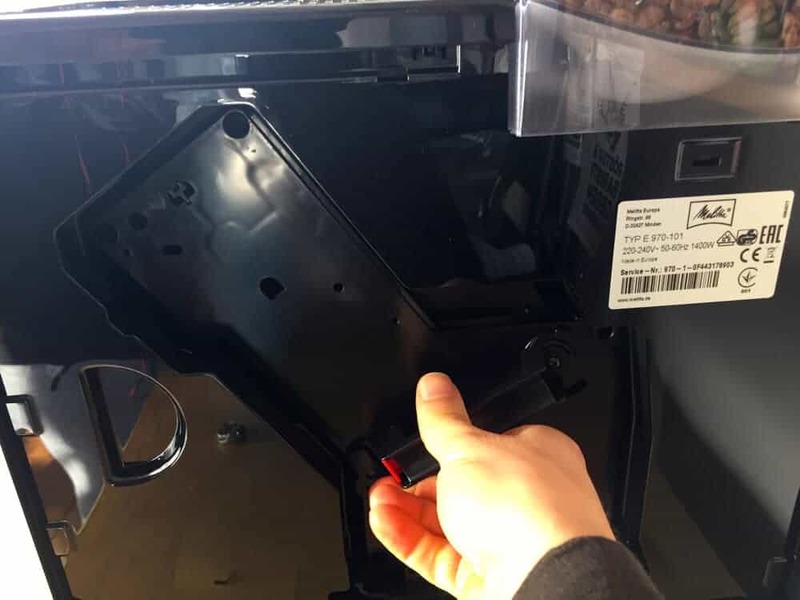 Normally people use this compartment for decaf coffee, but this machine already has two bean chambers. That means you could use regular coffee in one and decaf in the other. Plus, the advantage of an automatic machine is that it freshly grinds the beans every time you use it. Therefore, this compartment is just a kind of emergency backup option, in case the only coffee you’ve got on hand happens to already be ground. Nevertheless, I wouldn’t use this compartment. The bean compartment has a lid with a rubber gasket that seals the compartment well. As you can see in the picture, I filled up the chambers with two different kinds of espresso beans. 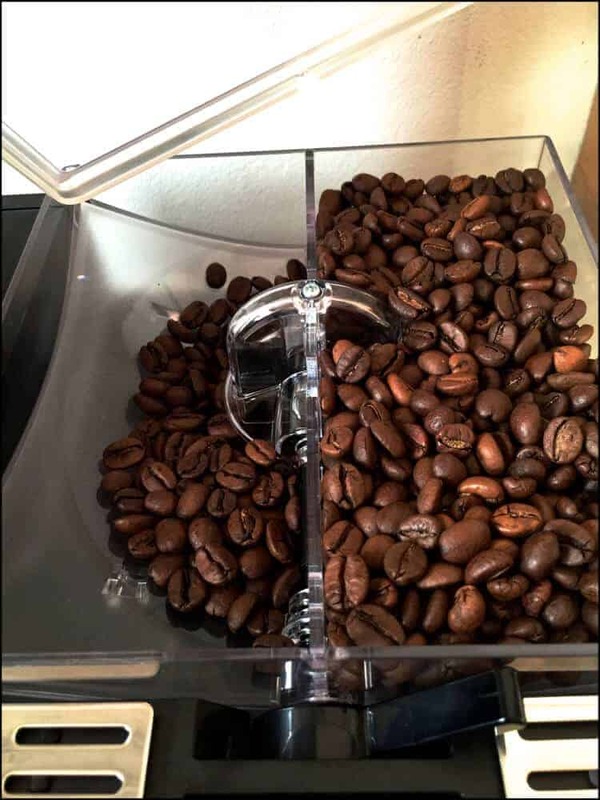 This machine has two separate bean chambers. 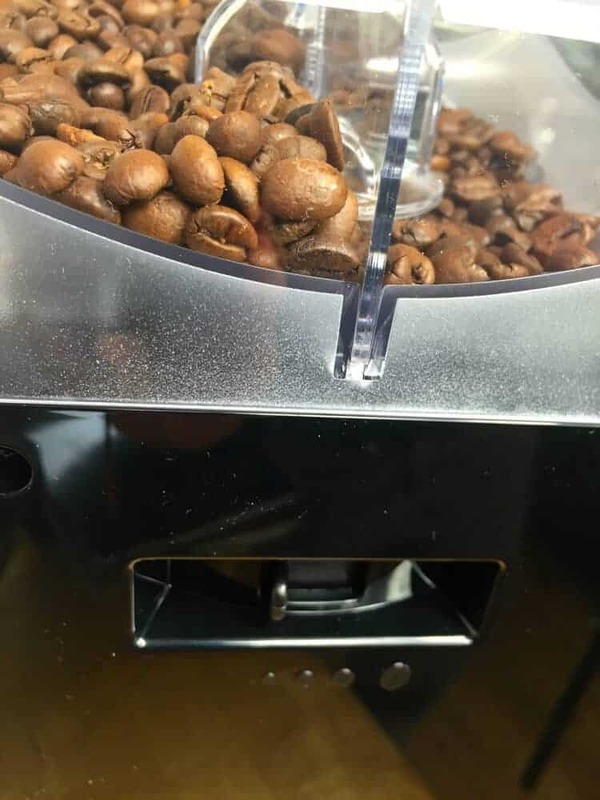 At first, I just thought, “Hmm, that’s nice.” After trying it out more, I think that dividing the bean compartment into two chambers is very clever and useful. You just flip a switch to change from one chamber to the other. The Melitta Caffeo CI clearly is well thought out, and this is a simple – yet good – improvement. 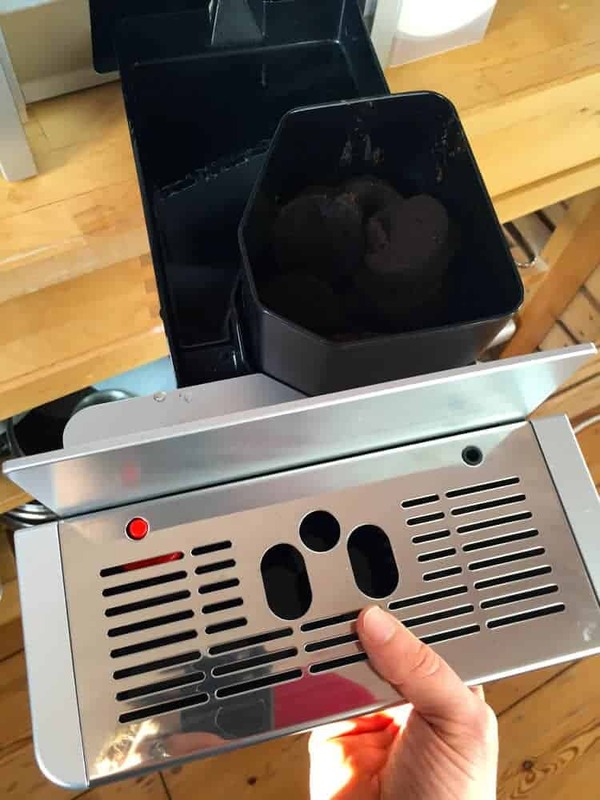 However, remember to make at least one espresso after switching chambers, as there will still be some beans from the other chamber left in the grinder. When buying an automatic espresso machine, you should always consider how you will clean it. The Melitta Caffeo CI has an easily removable brewing unit. It is actually the same brewing unit you’ll find on many machines from Siemens, Bosch and Miele. The fact that it is removable is a big advantage when it comes to cleaning. Your coffee will taste better. You won’t have to decalcify the machine as frequently. Both are true because a water filter reduces the hardness of your water, which reduces the water’s calcium content. The harder your water, the more sense it makes to use a filter. You can check your water hardness with the included testing strip, then save the hardness in the memory of the Melitta Caffeo CI. Of course, you can also run your water through a Brita filter before using it in the machine, or buy water that’s less hard than yours. Cleaning the hose and steam jet is easy. As you can see in the picture, you can put the milk hose directly in the drip tray. Then the machine automatically cleans out the hose with hot water. You can easily remove the steam jet and the drain vent for cleaning. Doing both steps will solve almost any problem you could potentially have with this machine. 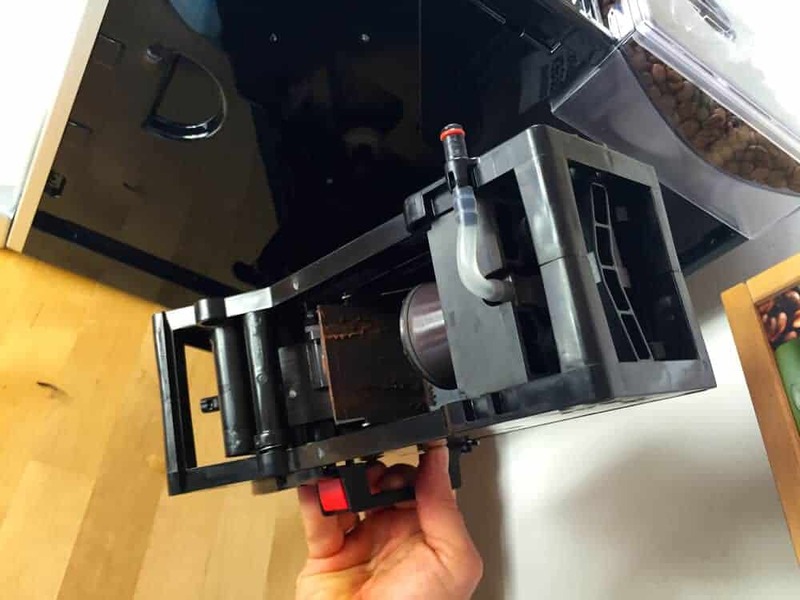 If your espresso isn’t flowing out of your Melitta Caffeo CI because the spout is clogged or because of another problem with the discharge, then simply take it apart and clean it. The water tank can hold 60 ounces (1.8 liters) of water. It has a good handle and is easy to remove from the machine’s left side. You can also install an optional water filter. I suggest not leaving water in the tank for a long period of time. If you won’t use the machine for a few days, empty out the tank and let it dry. 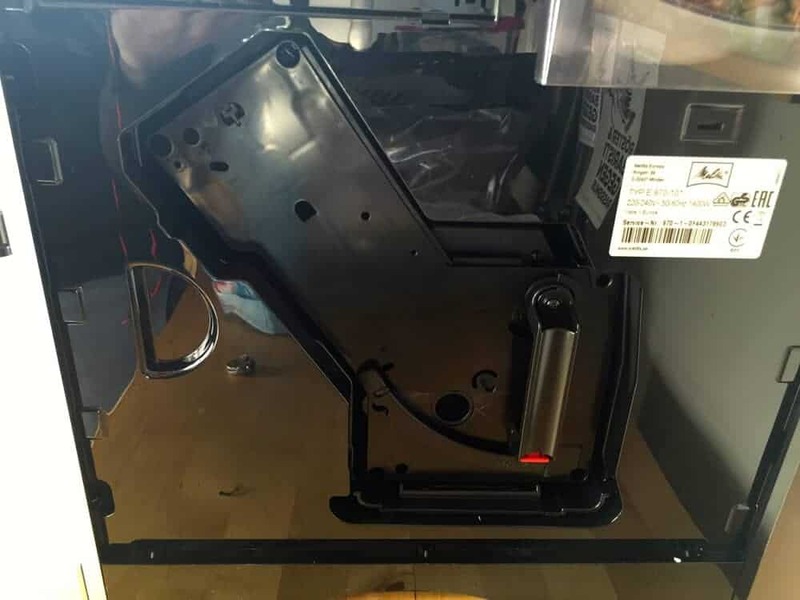 The catch tray and the drip tray are removable from the machine’s front. Its drip tray is rather small and fills up quickly. 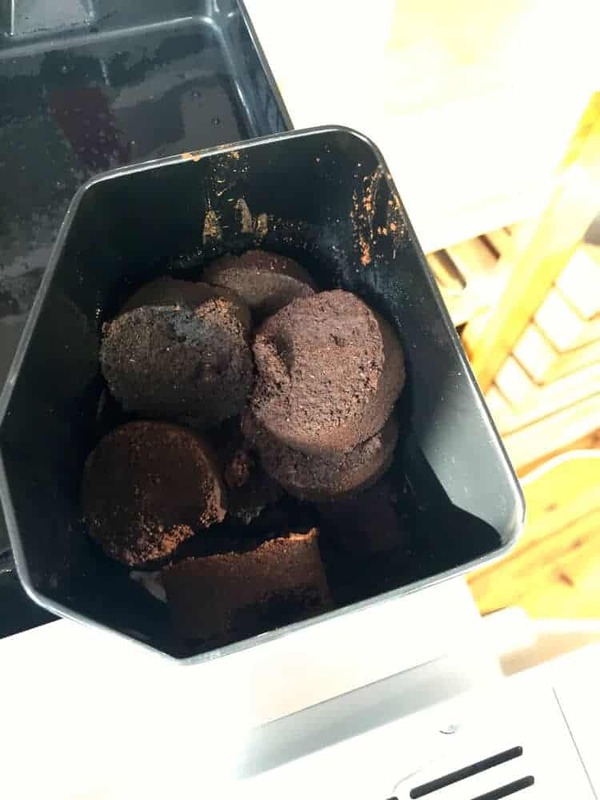 That’s why it is a good idea to put a container under the spout when you turn the machine on and off, so the drip tray doesn’t fill up as quickly. The catch tray for the coffee grounds is normal-sized. The grounds, which are basically coffee pucks, were just a bit damp. You can remove the metal grill and clean it with glass cleaner. I recommend cleaning the catch tray as often as possible, using running water and a sponge. 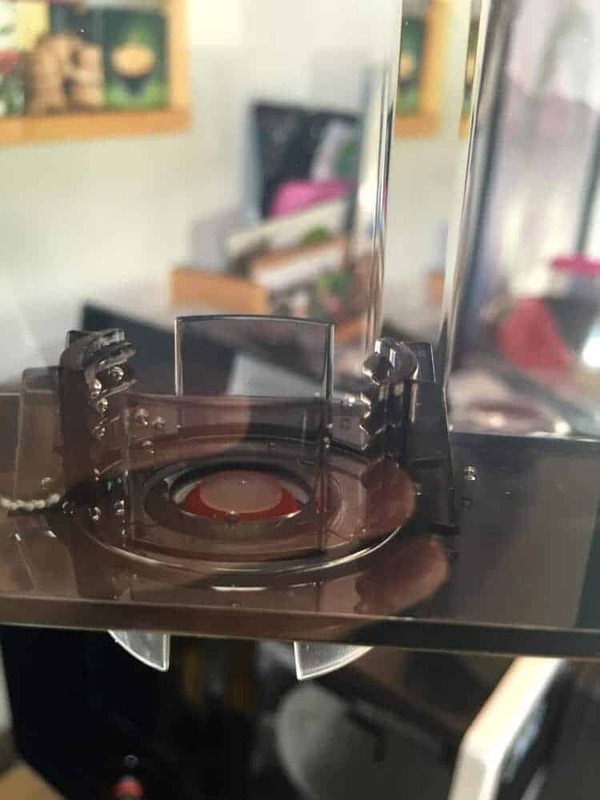 The red plastic bit is a floating gauge that indicates the water level in the drip tray. The Melitta Caffeo CI has a few cleaning programs, and they work very well. After using the machine, it will ask if you want to run the program to flush out the machine. I think this is better than machines that clean automatically, as it gives you a chance to put a separate container under the spout to catch the water from the cleaning program. Melitta also sells two liquid cleaning products: the “Perfect Clean” milk system cleaner, and the “Anti Calcium Liquid Decalcifier.” However, you can feel free to use cleaners from other brands if they have the same ingredients. 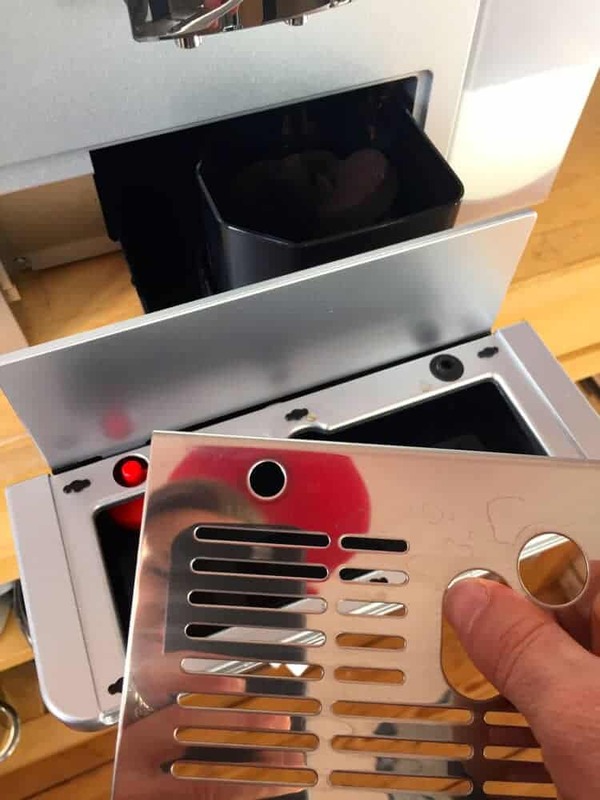 You can remove the brewing unit by opening a flap on the side. If the brewing unit looks familiar, that’s because it is the same one used in machines from Bosch, Siemens and Miele. You need to press the red switch and slide the lever up to remove the brewing unit. If you don’t, it will get jammed. If it’s not easy to take it out, something is not right. The best way to deal with it is to turn on the machine, and then turn it off using the front switch. This moves the brewing unit into the standby position, which lets you remove it. Doing it doesn’t take any effort at all. You can simply rinse out the brewing unit with running water. Ideally, you should do this every day that you use the machine. 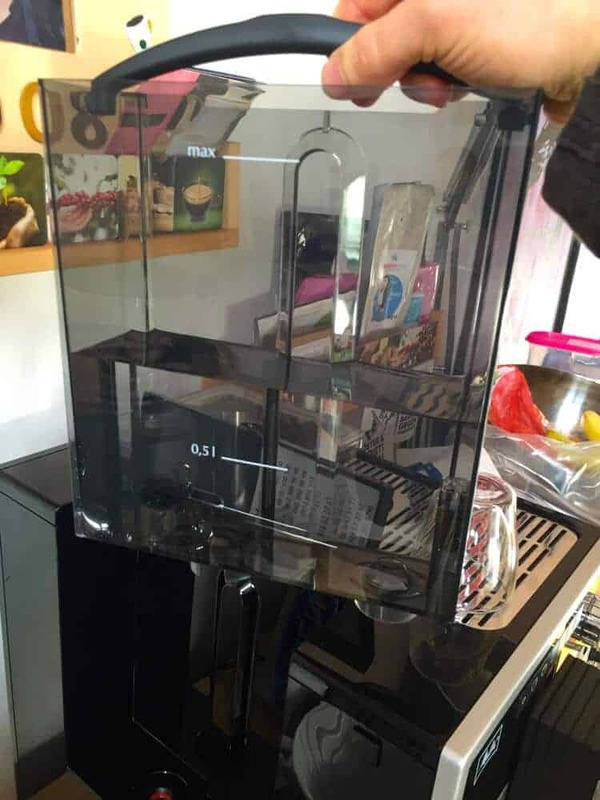 Although the brewing unit is made of plastic, it gives the impression of being significantly better made than the brewing units in cheap DeLonghi models. Which Kinds of Milk Make Foam? You can make milk foam with basically any kind of milk if you are using a cappuccinatore. It even works with homemade almond milk, which is good news for soy milk drinkers and people who are lactose intolerant. I thought it was rather interesting that the Melitta Caffeo CI was very similar to the recently reviewed Miele CM 7500 in terms of the way they are built. However, the Miele somehow still costs more than $1,800 more. In other words, with the Melitta Caffeo CI, you will get a similar performance for a much better price! It also turns out that the same factory (Eugster Frismag) makes many of the same automatic espresso machine parts for different manufacturers. So that would explain why the brewing units are so similar. There is also a rumor going around that Melitta machines use some technology from the company Jura. Both manufacturers get their components from the same producers, but they have different technical approaches, in the end. For example, Jura doesn’t make their brewing units removable. So you can’t really say that the devices are actually identical. The same goes for machines from Nivona, Bosch, Siemens and Miele. This machine is very easy to use and to clean, and it has a two-year warranty. Fortunately, the plastic smell that I noticed at first went away after a good initial cleaning. The dual bean chambers are surprisingly simple and useful. Now I can finally choose between two different kinds of espresso in the same machine. For an automatic espresso machine in this price class, the noise level is also normal. When it comes to cleaning, the self-rinsing milk hose and the removable brewing unit are especially useful. 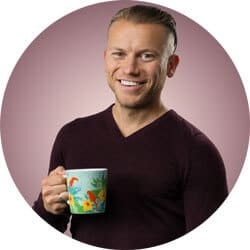 The cleaning programs, as well as the rest of the machine’s software, also leave a good impression and seem well thought out. The plastic milk container is practical because it lets you easily see how full it is. It doesn’t matter at all to me that the container isn’t thermally insulated because, when I’m done with the milk, I always put it right back into the fridge anyway. You can decide for yourself whether you want the plastic container for your milk – it’s a matter of personal preference. At 5.5 inches (14 centimeters), the spout is nice and high. You can manually slide it up and down to adjust the height. You can check the price on Amazon.co.uk. It’s also easy to find accessories and replacement parts. I don’t recommend any machines from Jura, which is the company that people always seem to compare Melitta. 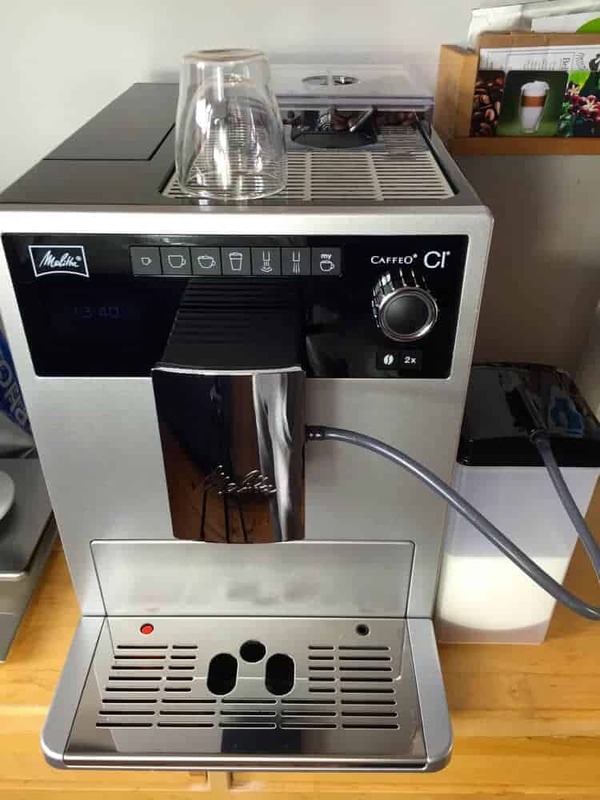 However, one possible alternative to the Melitta Caffeo CI could be the Siemens EQ 6 700. It’s already been more than six months since I originally wrote this review. 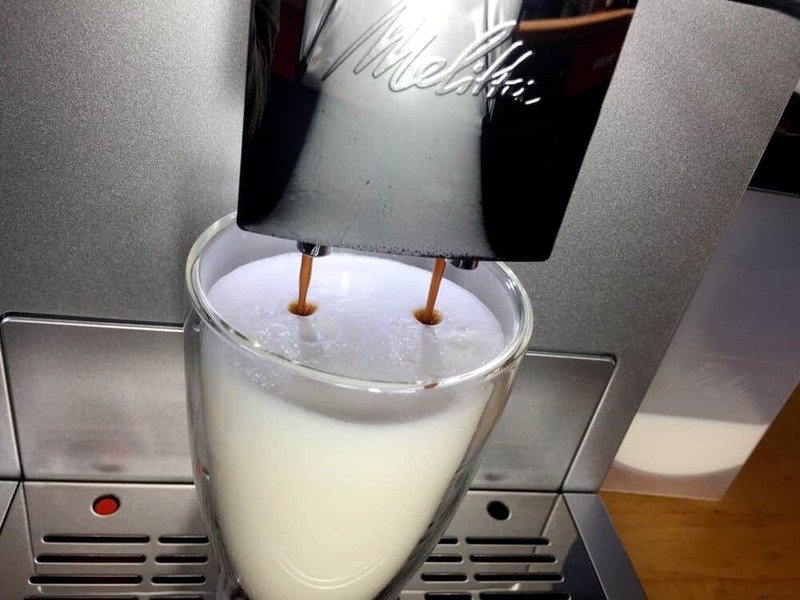 In the meantime, we have been using the Melitta Caffeo CI in our office every day, making more than 400 drinks. When talking about automatic espresso machines, it is good to not only think about how it works when it is brand new, but also how it holds up over time. Is it still nice to use the machine after a few years, or does it start to fall apart shortly after the warranty expires? 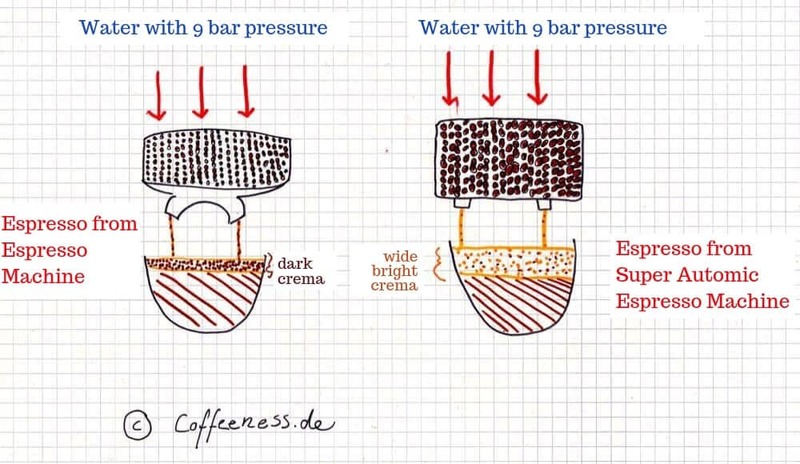 We have also had a chance to compare the Melitta Caffeo CI with the winner of the tests done by Stiftung Warentest, an organization roughly equivalent to Consumer Reports, but in Germany. Their winner was the Saeco Moltio. (You can watch my review of that machine here, but unfortunately it is available only in German). We really liked both machines, but we thought that the Melitta Caffeo CI came out slightly ahead. It always faithfully performs its duties. I also noticed that, in the meantime, Melitta released a Special Edition version of the Caffeo CI. That one is black and comes with an insulated milk container. Unfortunately, it is also a bit more expensive. We haven’t had to buy any replacement parts yet, although I would have been interested in testing them out. Still, whether you need to replace the drain vent, the milk hose, the water tank, or even the whole brewing unit, there is a very good supply of replacement parts. You can find them here on Amazon. In any case, when it comes to our machine, after six months, everything is still running as well as it did on day one. Two of my co-workers would like to add a few comments about the six-month test we’ve done for the Melitta Caffeo CI. 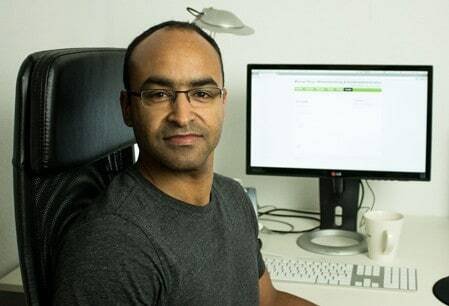 Mauricio: I use the Caffeo CI every day, actually. I’ve even invented my own drink. I always make a café americano with an extra shot of espresso, and then add a nice layer of milk foam to top it all off. I especially like how this machine works so quickly and still manages to make really good milk foam. Even cleaning it is less work than I imagined. Then again, we also quickly stopped using the milk container and put the hose right into the milk carton. It’s just more efficient when making many drinks, and when the milk runs out, we just pull out another carton from the fridge. If you just put in a bit of effort to polish the outside of the Caffeo CI, the machine looks brand new. It will be interesting to see what it looks like after a few years. We were all super excited when Arne told us, “This machine is for the office, but the only condition is that you need to use it a lot.” We definitely have. 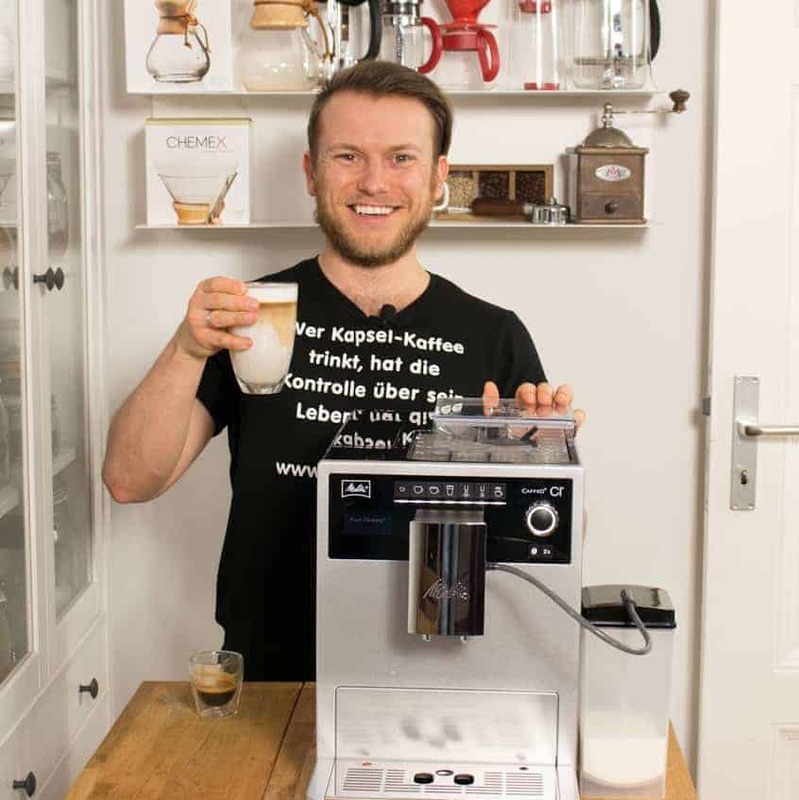 Micha: I make myself a few cafè lattes every day, and now I couldn’t do without our Melitta Caffeo CI. However, my thoughts on espresso volume differ from Arne’s, and I still make the preset 1.7-ounce (50 ml) espressos. Even though “that’s not a real espresso,” it’s what tastes best in lattes, in my opinion. I am also responsible for cleaning the brewing unit. I do it once a week, as well as any time that I know Arne will be coming into the office. At home I have a traditional coffee maker, and it’s a good way to start my morning. However, the only way I can get through a long, strenuous workday is with the help of my friends, cappuccino and latte. I’ve been very happy with this automatic espresso machine. The only thing that wasn’t simple was changing the water filter – that was a real pain! However, then Arne showed me that you could use a plastic screwdriver (which was actually still inside the box) to change the filter. Now I know better. In any case, we will keep on testing and report back to you. Loved reading your detailed review! I live in Australia and I’m thinking of buying this machine. Thank you for an awesome review. I’m from South Africa and have been considering this model against Jura and also the new Melitta TS model. This has given me much to think about.